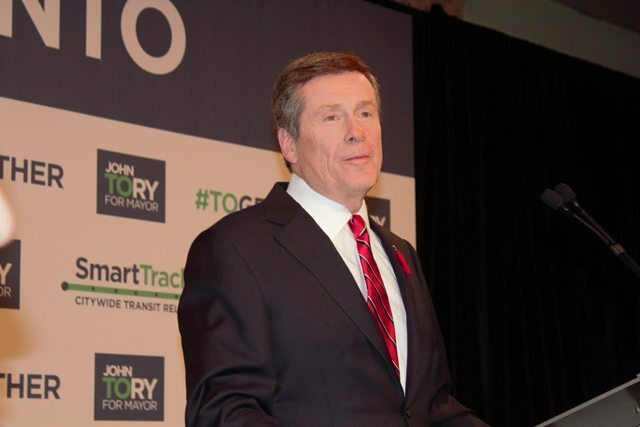 John Tory launched his SmartTrack plan with considerable fanfare in May 2014 as the centrepiece of his mayoral campaign. From the outset, the proposal did not stand up to criticism on many grounds, including engineering feasibility, potential demand, benefit for the transit network, and cost and funding. Two major aspects of SmartTrack were reviewed in studies released on January 19 at a mayoral press conference and technical briefing. The two studies tell a very different story about the state of SmartTrack and the current thinking behind this project. Prepared by international consulting firm HDR Corporation, the Western Corridor Feasibility Review examined the proposed SmartTrack route west along Eglinton Avenue from Mount Dennis to the Mississauga Airport Commercial Centre (MACC). In excruciating detail, this study establishes that although it is physically possible to build SmartTrack, the technical challenges will be considerable and the associated cost will be high. This is not “new” information to anyone with an ounce of sense about railway engineering, but the Tory camp has steadfastly maintained that a continuous link from Union Station through the Weston rail corridor and Eglinton to MACC is what we would see. An alternative route, running north around the airport, was also studied—it proved equally difficult and impractical. A route via the Woodbine Centre and the north side of Pearson Airport would significantly add to travel times. The combination of SmartTrack and the planned GO/RER services in the Kitchener corridor would likely require additional tracks beyond the just-completed new construction. Grade-separated heavy rail would cost up to five times as much as LRT in the Eglinton corridor. The LRT option would attract two to four times the ridership of a heavy rail option primarily because it would serve a larger area with more stations. “Significant community impacts” include the need to acquire property and demolish buildings, notably in Mount Dennis for the connection to Eglinton West from the rail corridor. “Significant grades and curves” include design specifications beyond normal standards even for electric railways, and pushing well into subway territory with steeper grades and tighter curves. Because these limit operating speeds, travel times would be higher than if normal railway standards were used. City Planning now speaks of “driving a stake” into the scheme for electric GO/SmartTrack trains running along Eglinton, and will recommend that the previously studied and approved western extension of the Eglinton-Crosstown LRT be built instead. They even have a new name for it—Crosstown West. The LRT would cost $1.3 billion, a far cry from the $7.7 billion needed for the most expensive iteration of SmartTrack’s western spur. The question remains, however, of just what demand on a future network including an abridged SmartTrack would look like. Where would the riders travel? How would the line affect other parts of the network? Can the capital cost of whatever is built be justified? A report from the Transportation Research Institute at the University of Toronto reveals the outcome of demand modelling studies for SmartTrack itself and other parts of the network. This study uses a new model for travel in the Greater Toronto and Hamilton Area (GTHA) which is much more sophisticated than previous versions. The model handles a more finely-grained network, more variables affecting travel, and bidirectional flow so that counter-peak travel to the suburbs is included. Looking simply at service frequency and fares, the projected demand ranges from 37,680 (trains every 15 minutes with GO Transit fare levels) to 314,567 (trains every 5 minutes with TTC fares) in the model for 2031. Just as total ridership goes up, so do the number of people who would be attracted onto transit, particularly at frequent service and lower fares. That is a huge range, and it shows how sensitive the concept is to assumptions about what “SmartTrack” actually means. From page five of the SmartTrack Ridership Forecast report [PDF]. There is only one problem—the study did not review the viability of very frequent SmartTrack service, and the high demand depends on trains arriving at close-to-subway frequencies. Indeed, the study is very much a “what if” exercise to see what would happen if somehow service could be operated at these fares and frequencies, but totally divorced from costs or feasibility. Moreover, only the “full” SmartTrack route appears in the report (although other schemes may have been tested) with a line running from MACC to Markham, a configuration that will definitely not be built, at least in “phase one” when the line most likely will terminate at Kennedy Station. 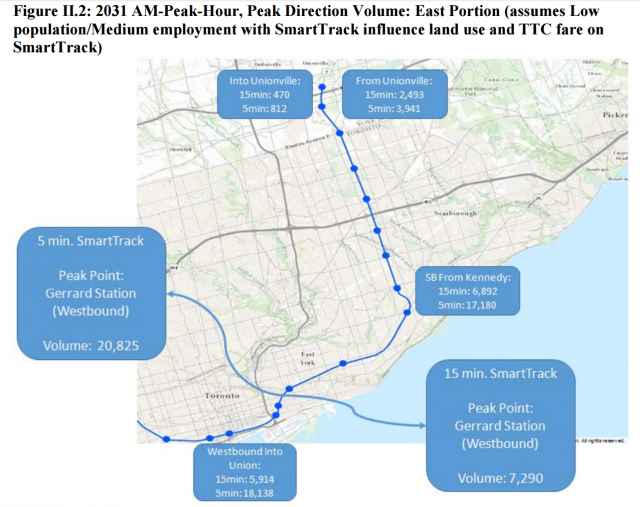 SmartTrack apologists including Mayor Tory and a related advocacy group Friends and Allies of SmartTrack organized by the mayor’s campaign manager repeatedly emphasize the importance of links to major employment nodes in the 905. But this premise runs aground on the very demand models claimed to support for SmartTrack itself. West end ridership demand map from page 11 of the Ridership report [PDF]. Map of east demand from Ridership report, page 12 [PDF]. The projected peak hour demand in 2031 outward to the Mississauga Airport Corporate Centre is 737 passengers for a service every 15 minutes, or 2,109 if every five minutes. For travel to Markham, the peak hour numbers are 470 and 812 for the two service levels. If the future of the GTHA depends on people riding outward on SmartTrack in the morning peak, this shows little evidence that many actually want to reach these destinations. The flaw in Tory’s plan is that both of these centres draw employees from a wide part of the region, and only a minority of them originate along the SmartTrack corridor. The situation is not unlike the Union-Pearson Express which, leaving aside its high fares, connects with only a small part of the total airport demand. The main role of SmartTrack is to provide inbound transit to Toronto’s downtown core, with peak hour demands of 18,000 and 9,000 from the east and west respectively at Union Station. 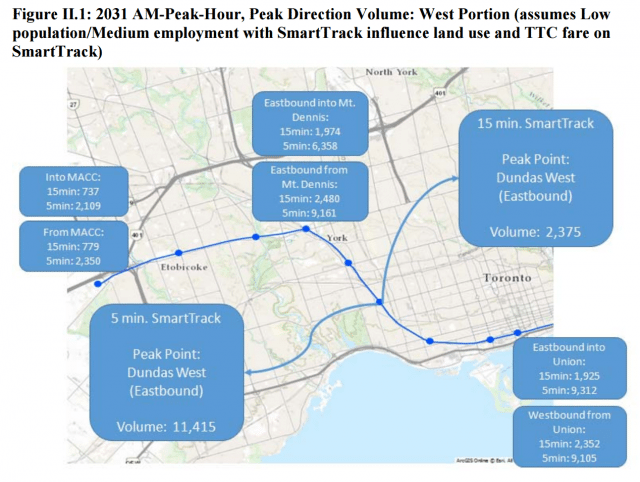 According to the model, most of the westbound riders (over 80 per cent of the peak point demand) would already be on SmartTrack leaving Kennedy Station. This implies a huge transfer of demand away from the Danforth subway, and begs the question of what function, if any, the Scarborough Subway might have if so many riders would use SmartTrack. All this, of course, presumes that a five minute service could actually be operated. From the Ridership report, page 10 [PDF]. SmartTrack would reduce demand on the Yonge subway line south of Bloor Station, but only with the more-frequent option for SmartTrack service. The projected drop in subway riding with SmartTrack every 15 minutes is less than three per cent, well within the likely range of error in the model. With five minute SmartTrack headways, the Yonge demand goes down by an estimated 17 per cent. City Planners are quite clear on one topic—the continued need for a Relief Line separate from SmartTrack. Even with the most frequent SmartTrack service, the projected subway ridership is higher than today’s loads, and close to the theoretical limit even with a new signal system and more frequent subway service. There is a fundamental problem. Between the backlog of demand for transit service into the core, and an annual growth rate of about two per cent, any seven-to-10 year project will barely keep up with city growth. At most, it will prevent the central part of Toronto’s subway network from snarling with demand far beyond its capacity, but subway congestion is not going to disappear. Missing in this entire debate is any commentary from Metrolinx. They owe Toronto and the GTHA a substantive, informed description of the engineering and operating challenges of integrating SmartTrack at various service levels on their corridors. Is this a case that with enough money, anything is possible, or are there hard limits? How much of the GO/RER project would be compromised by dedicating rail corridor capacity to SmartTrack? What are the practical limits on delivering passengers to and from Union Station by the tens of thousands in the peak hour? Drawing lines on a map and running unconstrained models of rider behaviour are favourite pastimes for politicians and planners in Toronto. Some day, and soon, the City and Metrolinx must deal with reality, and that means they must address what can actually be built and acknowledge what should not be attempted. Recognition that heavy rail on Eglinton West will not work is a good start, but that segment is only one part of a scheme rooted far more in fantasy than in realistic planning.